← How much fabric should you buy? 1: Cut two rectangles of fabric. Their width should be [your baby’s chest measurement – 3″], and the length should be [the measurement from crotch to neck (the length of their torso) + 2″] — if you need a general number because you don’t have a baby on hand to measure, cut 16″ wide x 19″ long…that’s about a 6-12 month size. note: The rectangles are shown sideways in the photo above, with the grain running horizontally across the photo. 2: Now you need to draw the leg holes. Along the bottom (usually shorter) edge of your rectangles, make a mark at the center with your marking pen, then draw a line 2.5″ from either side of center along the bottom edge and 2″ high. This will create a 5″x2″ rectangle that will become the snap panel between the legs. Then make another mark along each side, 5″ from the bottom, and connect the rectangle to this mark with a nice curved line. 3: Cut these curved areas out. 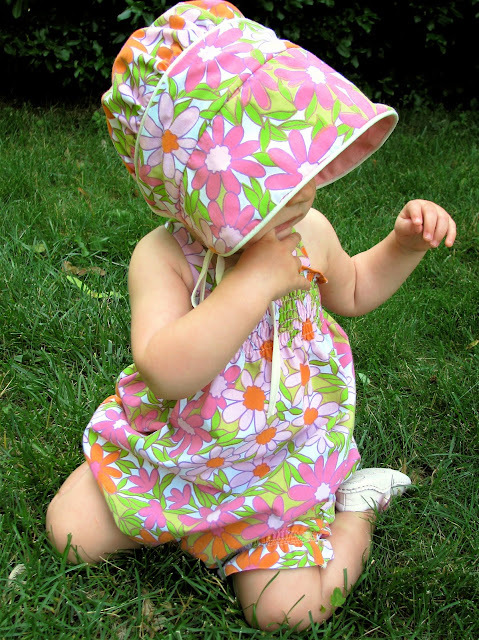 4: Sew the long sides of the sunsuit together, right sides facing, with a 1/2″ seam. 5. Fold up 1/2″ at the bottom of each rectangle toward the wrong side and press. 6: Fold another 3/4″ up, this time towards the right side of the fabric, and press. Stitch the sides down, 1/2″ away from each edge. 7. Clip the bottom corners with a scissors close to the stitching, then turn this part right-side-out, use a pencil or knitting needle to push out those corners, and press. This will become your snap panel. 8. Fold under 1/4″ twice around the legholes, and pin in place. 10: Finish the top edge of the sunsuit opposite the legholes. You can do this by folding over the top edge 1/4″ twice and stitching down, or doing a rolled hem or zig-zag stitch, up to you. Shirring: Loosely wind elastic thread (I recommend Gutermann, not Dritz) around your bobbin, load it into your machine (you may need to loosen your bobbin tension a bit with the little screwdriver if you have a front-loading bobbin), and sew with thread on top and elastic thread in the bobbin around the top of the sunsuit for 6 rows, keeping each row of shirring about 1/2″ apart (see my shirring tutorial for more shirring resources) so that you have about 3″ of shirring. 11. Keep the elastic thread in the bobbin and sew along the legholes back and forth for 2-4 rows, about 1/8″ apart. Use your iron and lots of steam to press the elastic thread, both at the top and bottom of the sunsuit. It should shrink up nicely. 12. Add snaps to front and back. Remember that the snaps should go on the bottom of the front snap panel, but the top of the back snap panel in order to overlap properly! 13: Make the straps: Cut two strips 2″ wide by half your rectangle length; for the 6-12 month size, 2″x9.5″ is great. Go to my Easy Strap Tutorial to see how I made my 3/4″ wide straps. I put buttonholes in the ends but you could also use snaps here. Another option would be to do a pair of ties at each shoulder. 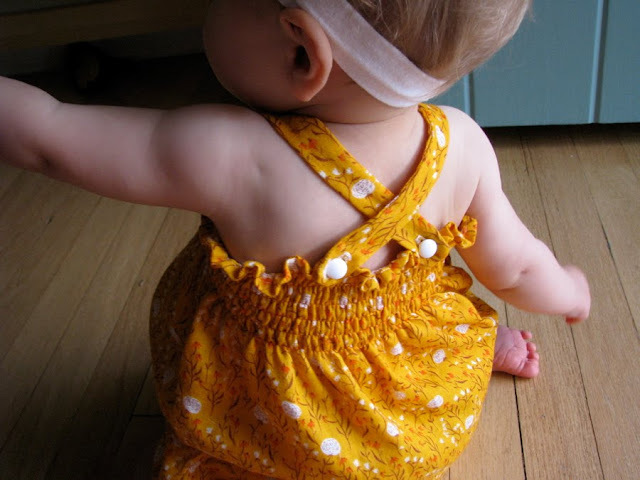 14: Stretch out the top edge and mark 3.5″ from center on both the front and back of the sunsuit. Pin your straps to the front at each mark about 1/2″ from the end of each strap. Try the sunsuit on your baby if possible to check the strap length. Sew your straps down at each mark. 15: Sew your buttons to the back top edge, again 3.5″ from center. Cross the straps in back, and you’re done! The other day I found this page of sunsuit diagrams and instructions that I had all but forgotten about after we moved last year. Written with little hand-drawn diagrams onto a 1-page sheet, ready to scan. Seriously? Sometimes I amaze myself. So it’s now ready for you to download and print, just in time for summer sewing. The only thing I would say is if you’re going to use this sheet, sew the sides together after you’ve cut out the legholes (step 7), instead of before. Not a big deal, just something I realized after I’d drawn the whole thing out and was too lazy to go back and change. It’s also missing the part about the straps and buttons, but hey, it’s free (read: CAMPY)! Enjoy! Click on the image above for your very own 1-page Sunsuit Instruction sheet. DO NOT DISTRIBUTE OR RE-SELL THIS PDF WITHOUT PERMISSION! THANKS! Squee! I love it. Too bad my “baby” is now four. I need to find a baby girl to make this for!! 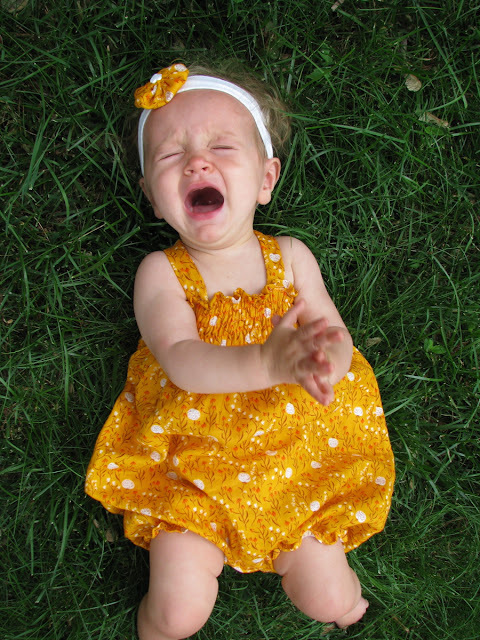 Thanks for this… my baby is in dire need of a sunsuit! I’ll just have to figure out how to work the snap tool that I “inherited without instructions” from my grandmother, or use an old onesie! What a great idea!!! Emilie, Oftentimes you can find blogs or other helpful pages detailing how to use things, like your inherited snap tool. If you know the brand of it, try googling “help with X snap tool” or something like that! U can make boy rompers. I did. I skipped shirring & just did a more fitted shape & boy fabrics. You can even use your husband’s old button down shirts & keep the buttons. They can look a lot like this one, but “boy style”. I paired mine with a bucket hat. If you use daddy’s shirt, save the collar for the accent strip around the hat to coordinate. I love that photo! So cute. I just love that photo! Its winter here in Australia, so I’ve pinned your tutorial for November. I could see a swimsuit version working well too, so I may well make a couple. I have always wanted to make one of these. However, I’m totally scared to death to try shirring. I love the look of this. Thank you so much for sharing your wonderful talents with us! YES!!!! I squealed with delight when I saw this post!!! This is my favourite thing to make for all the baby girls in my life and I am SO happy the update is here! It makes so much sense!! Fun sewing project! Anti-snap-setters might consider buying snap tape, which is less wiggly than snaps that are cut from a stretchy bodysuit (albeit less thrifty)! Thank you for your wonderful tutorial. I have a question. In the sheet the rectangle measurement is chest measurement minus 3 inches? Yes, the width is chest minus 3″ — why, did I mess that up somewhere?? 🙂 LMK! I’m about to try this suit- how will it fit if you make teh chest 3″ smaller than the measurement and then shir…I am trying to understand but I can’t see how it won’t be too small?? Thank you!!!! Love your things. There are TWO pieces that comprise the sunsuit, a front and a back, so if *each* piece is 3″ less than the chest measurement, you’ll still have a circumference that is TWO TIMES the chest, minus 6″ if that makes sense. Then the shirring will cinch it up so it fits nicely. What is the fabric you used in the pink one? Love this pattern! Thank you! I actually tried making this and it ended up a dress (a very cute dress, nonetheless 🙂 because the snaps/leg holes did not work out (putting it nicely lol) I may just have to try this again! I love this! Has anyone made one for a newborn or a 0-3 month old? I’d love to know what measurements worked for them. Great pattern, easy to follow and fast to finish! Thanks! Did you make the matching bonnets too? If so, how?!? They are adorable! It’s so adorable! Unfortunately, I completely misunderstood the instructions on step 2 and ended up cutting the space 2.5″ TOTAL for the crotch :/ Only when I got to step 6 did I start thinking, Whoa…this can’t be right. I feel a bit silly now! I’ll blame it on lack of sleep, lol. No changing it now! Onward! I made one of these last year in the size you give measurements for, and have to say it was my favorite outfit of the Summer. I’m currently making another one in a bigger size for this year! So excited! Thanks for the awesome tutorial! I ADORE this! I was wondering, though.. Instead of shirring, could I add 1/4″ elastic for the legs? How would I do that? Just make a casing where the shirring would be? Any ideas? Thanks so much! I have made it an annual tradition to modify the VBS t-shirt that my kids get for participating. This year I used this guide to make a cute little romper for my daughter, and it came out super cute! I did a couple of things differently, but the overall concept was yours. Thanks for making it so easy to achieve an adorable look!